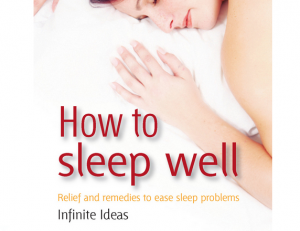 Buy This Book “How to Sleep Well: Relief and Remedies to Ease Sleep Problems” by Infinite Ideas, on Amazon! Click to purchase! After years of restless sleep because my mind wasnâ€™t ready to turn off, I came up with some natural remedies to ease it to sleep. 1.When you get home from work, set the lights low. Use minimal lights or just light candles. This helps the mind and body realize that itâ€™s almost time for bed and signals it to slow down. 2. Mark things off your to do list and know that everything will be accomplished one at a time in order of importance. Learning to control your impulse to do everything NOW will help you sleep better at night. It will all get done, so stop worrying. 3.Have a hot cup of tea. Ainâ€™t no shame in Sleepy Time tea! Something like tea will be recognized as a bed time ritual after a while. 4.Take a hot shower in the dark. If you take a cold shower to wake up, youneed to take a hot shower to go to sleep. The dark + the heat will slow the body right down and clear your mind. 5.Aromatherapy. The best money Iâ€™ve ever invested was in a kit of essential oils. Lavender and Frankincense will ease you right to sleep and some other mixtures will knock you out. I love hearing from you! Let me know if one or all of my tips have helped you! Join the facebook group, #nikkinurtures on instagram or twitter, or email me at info@nikkinurtures.com!